It is hard to turn your head without seeing the acronym CBD. It’s on Instagram, in magazines and in an increasing number of beauty and personal care products. How much do you know about CBD? If you are like me, you know it has some relation to marijuana. You might have some ideas about what it’s purportedly good for—anxiety, inflammation, pain, etc. As more products with CBD hit the market, it’s important to clarify what it is, where it comes from and what makes it different from what gets people high. Cannabidiol, known as CBD, is a compound that occurs in the flower of the cannabis plant. This is one of more than 100 chemical compounds found in plants in the cannabis family. Common misconceptions about CBD arise the moment someone hears the words “cannabis” or “marijuana.” THC, or tetrahydrocannabinol, is the chemical in marijuana that makes you “high” when it is smoked or ingested. Though only a single atom separates it from THC, CBD is not psychoactive and cannot get you high. CBD is extracted from hemp, which is in the cannabis family but contains very low levels of THC. Most recently, industrial hemp has been legalized in the U.S. for numerous applications, which helped spark the growing interest in CBD-containing products. In addition to this legalization, MarketWatch says investors and executives are “swooning” over CBD’s potential to be a multi-billion dollar market. 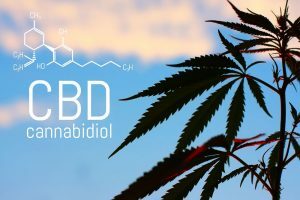 So, what are those CBD products actually used for? This is where things get tricky. Scientific research on CBD is in the early stages, with different opinions and conflicting findings. In most instances, products infused with CBD are marketed as therapeutic treatments and an alternative to pharmaceuticals for a number of ailments such as anxiety, depression, inflammation, sleep disorders, PTSD, ADHD and routine aches. These are just a few of the many claims made by companies selling products infused with CBD and CBD enthusiasts, according to Project CBD. CBD is now being used in many beauty and personal care products, including skin creams, hair treatments and therapeutic oils. CBD products are becoming increasingly popular as an enticing addition to services offered by salons and spas. Depending on where you live, CBD products may or may not be allowed, and with the little clarity from the FDA about what is or isn’t illegal or safe, the discussion around the oil may be a bit confusing. To put it simply, if you’re considering adding these products to your salon or spas repertoire, tread lightly and proceed with caution. We’ll take a deeper dive into the surge of CBD products in salons and spas, in part two of our conversation on CBD products later this month.